It’s Christmas time again and this year we have another great Christmas competition for you. You could win one of two prizes of this year’s hottest board game, Santa’s Rooftop Scramble, courtesy of Luz Java. This Irish made game offers endless hours of fun for all the family and with a retail price of just €19,99, it’s sure to be a winner with families looking for real value this Christmas. To enter our competition just answer this simple question. What nationwide toy store chain is selling Santa’s Rooftop Scramble? You can find out the answer below. Closing Date: 11th December 2011 ** Note competition now closed!! Multiple award winning couple Noel Donegan and Luz Java have reached new heights with their latest addition to the market. 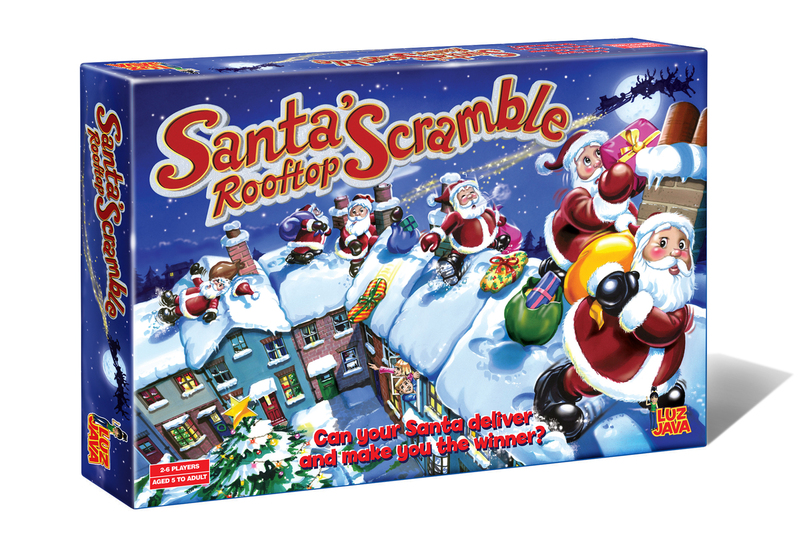 “Santa’s Rooftop Scramble,” their new board game is already a top seller this year in Smyth’s Toys. Santa’s Rooftop Scramble offers endless hours of fun for all the family and with a retail price of just €19,99 its sure to be a winner with families looking for real value this Christmas. Noel said ” It’s important in these financially challenging times to offer real value to already hard pressed families.” Noel and Luz made a decision to settle on a reduced profit margin by manufacturing Santa’s Rooftop Scramble, here in Ireland as opposed to China. Noel Said ” Hasbro Ireland did a marvelous job on the manufacturing as you would expect from one of the worlds leading toy manufacturers. “We are proud to be supporting Irish manufacturing and Irish jobs,”added Luz. Whether you are 5 years old or 95 years old Santa’s Rooftop Scramble is a joy to play and a wonderful way to get everyone together for some magical and fun filled family time. And as if that was not enough Santa’s Rooftop Scramble has another great surprise waiting for you when you open the box. Inside is a competition leaflet that allows you to send your picture and your name to Noel and Luz. If you are the lucky winner of the competition then Noel and Luz will have your picture illustrated and included alongside your name as one of the letter to Santa cards to be included in the next production run of Santa’s Rooftop scramble. smyths toy shop is selling them.merry christmas.Rose Walsh.